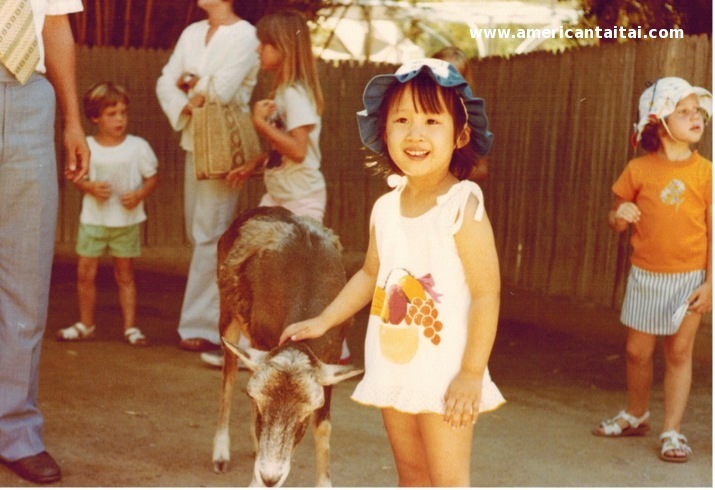 The last time I was at the San Diego Zoo, I was 3 and-a-half years old. I don’t recall much, but I think the highlight for me was probably the petting zoo. I remember it was really hot and certain animals had quite a strong “essence.” And even as a 3-year-old, I still recall wondering what all these wonderful furry animals were thinking. Did they know that they were living “the good life” in captivity being cared for and never having to worry about food? Or were they sad or depressed to be imprisoned in the zoo rather than living out their lives in the wild. I hoped for the former. Growing up, our family never had any pets. I think it has to do with both my parents being germaphobes, but I had always wanted a puppy (what kid doesn’t beg their parents for a puppy?) Later on in elementary school, we got a large fish tank and some tropical fish as a gift from family friends. Tropical fish aren’t exactly as exciting as a puppy, but I guess it’s better than nothing when you’re a kid. The fish would come towards us if we had fish food. And after they ate, I recall giggling as I watched them do their business in a long thin strand of brown fish poop that would drop to the bottom of the tank that I had to clean up later. However, a couple of months into our tropical fish adventure, we soon discovered that our particular fish had a death wish, and kept spontaneously leaping out of the tank Shamu-style when unattended, or when someone forgot to close the tank lid after a feeding. Were they trying to jump out towards freedom? Or were they simply bored? They’d helplessly flop around on the smooth ceramic tile by our living room fireplace next to the tank before ultimately expiring. We managed to rescue a few of them and place them back into the tank if someone happened to be home, but by the end, we probably had a total of a half a dozen fish jump out of our large tank. After the fourth or fifth toilet fish funeral, we decided to give up on the tropical fish, and gave the remaining fish, the tank and all the fancy tropical tank equipment away to another family. We said goodbye to our suicidal tropical fish. I confess that because I was a pet deprived child, I have somewhat of a fascination for cute animals. And the rise of the interwebz has helped to feed my interest and curiosity virtually as an adult. Cute viral YouTube pet videos? Send them my way! I love the funny animal memes that friends post throughout the day on my Facebook feed. One of my recent favorites is a Tumblr called giantpandaphotos, where giant pandas in captivity all over the world are featured and photos posted. 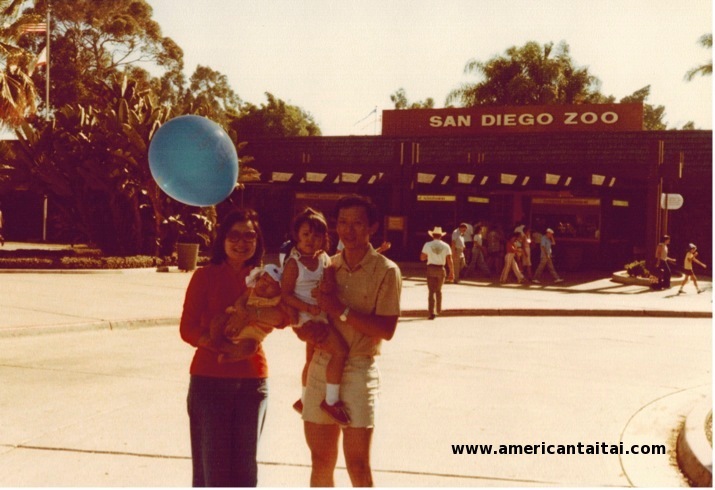 Through this Tumblr, I’ve gotten to know a family of pandas at the San Diego Zoo and have been following the adventures of Mom and Dad, Bai Yun and Gao Gao, Older Brother, Yun Zi, and Little Brother, Xiao Liwu. 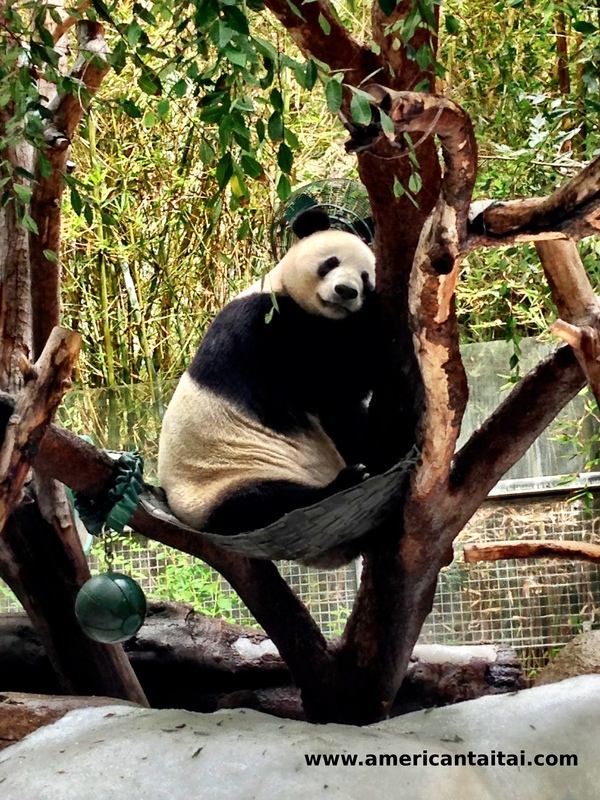 A few weeks ago, I was able to revisit the San Diego Zoo, and the highlight this time was definitely the Giant Pandas. 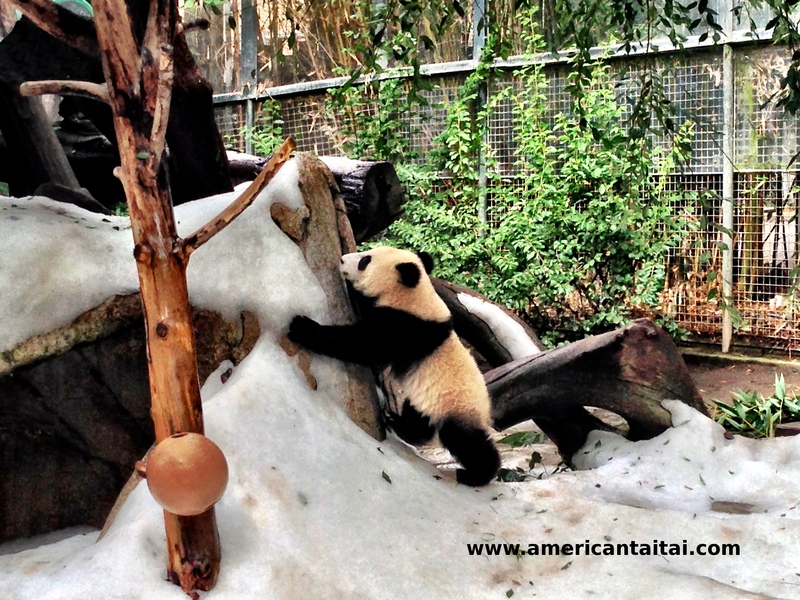 We were lucky as the day DH and I visited, the zoo had sprayed fake snow all over the panda exhibit as part of an enrichment program for the pandas. 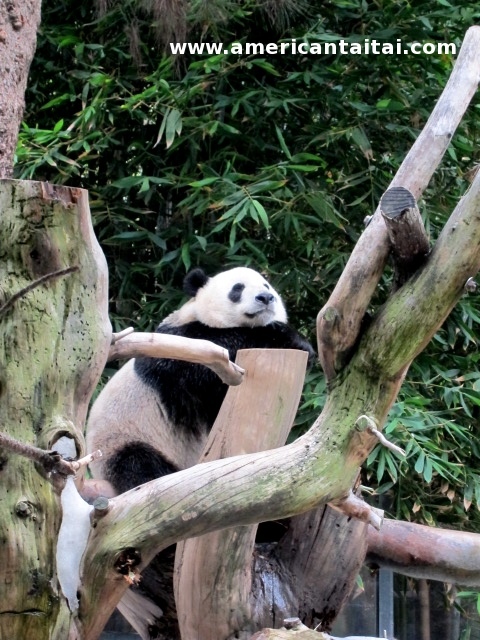 (Yes, pandas have enrichment programs, I didn’t know that!) 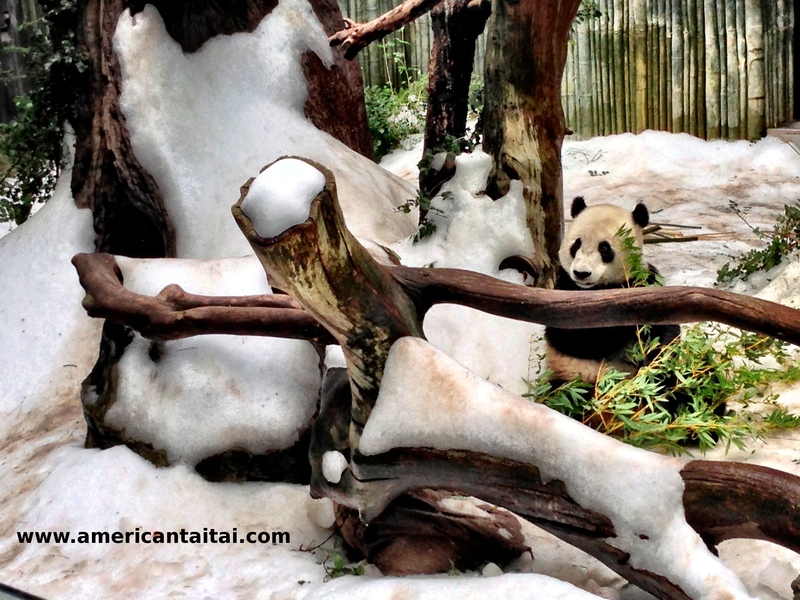 And as a result, we were treated to more frolicking between Bai Yun and Xiao Liwu in their temporary winter wonderland. And if you haven’t seen it, a terrific article about the history of pandas in captivity in the United States (and their unique reproductive challenges, pandas are very very finicky maters) was recently featured in the New Yorker. The modern era of Panda Diplomacy began in 1972 with China’s gift of a pair of wild-caught pandas to National Zoo in Washington DC to commemorate Nixon’s visit. China has since stopped giving pandas away and almost all pandas in captivity (including the panda cubs born in captivity) still belong to China, and are on lease by individual zoos. So why do people love pandas so much? Their unique black and white coloring looks rather ridiculous for a wild animal with no natural predators (other than humans.) And because they are bears with opposable pseudo-thumbs, they look much more human-like when they eat. Their expressive features and cuddly, rolly-polly demeanor makes us fall in love with them. Even baby pandas remind us of tumbling human toddlers rather than baby bear cubs. I guess that’s why we tend to anthropomorphize pandas and other animals, especially mammals. In many ways, they seem to exhibit human behavior, and many times, we don’t see them as being so different from us after all. I suppose this also explains the rise of books and literature studying the emotional lives of both domesticated dogs and cats, as well as wild, non-domesticated animals, and how we interpret animal behavior as human pet owners and observers. 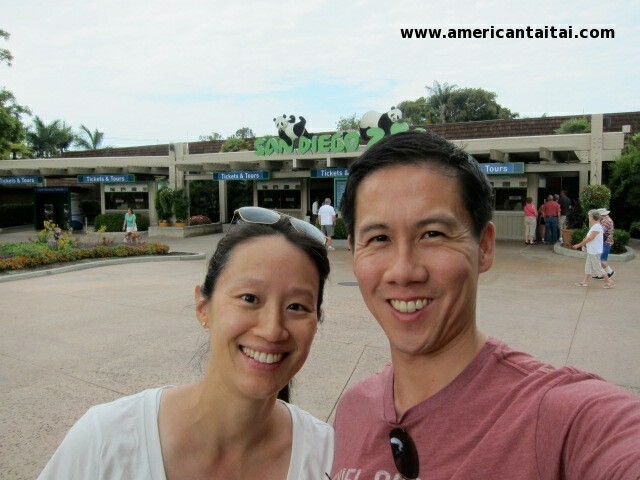 Revisiting the San Diego Zoo was terrific. It was both fun and nostalgic to visit the zoo again as an adult without kids. 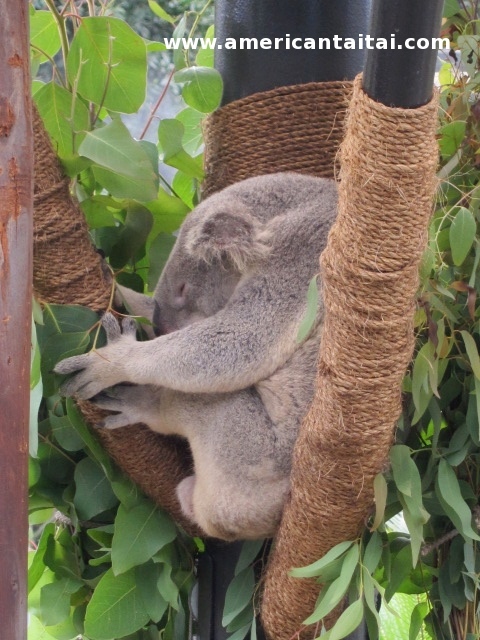 This time I was much more aware of how the zoo is a kid-friendly place. It’s large enough to have many exhibits, but small enough to tackle in one day. There are bathrooms and food stalls and places to sit everywhere. And as DH and I hid among strollers, digital cameras, and the families surrounding us, both of us heard the excited “Oohs” and “Ahhs” of enthusiastic animal loving kids (and parents) as they squealed in delight in catching glimpses of various animals eating or sleeping and playing, just like their human observers. I hope to go back one day with my own kids and to watch them take in the sights and smells with such wonder, awe, and excitement. What a fun trip, Angela! And I’ve got to say…you’re making me a panda convert! Awww…how cute (both the animal pics and the pic of you and your husband). I think Chinese of our parents’ generation are just not into animals, finding them to be dirty and a lot of work. I once had a mean-looking magpie type bird in my parents’ place in Taiwan, which I’d raised from a baby (he showed me no mercy). They’re supposed to be real talkers but all this guy did was swear to us in Taiwanese (the unfortunate result of having contractors work on my parents’ condo for a month) and copy the sound of your house slippers slapping against the concrete floor as you walked around. So it was like living with a really cranky out-of-work roommate that did nothing but curse and lay around the house all day in his slippers. So don’t feel like you’re missing out on anything. Oh well, I guess I can enjoy pictures of cute puppies as much as I want these days! 🙂 Or if I’m desperate, all I have to do is to take a walk around Green Lake, as there are always plenty of cute puppies being walked there. Thanks for your comments! Wow you’re a great story teller!! 🙂 I love pandas too! Thank you for your kind words, CC! Pandas are THE BEST. Maybe it’s just me, but they somehow just seem to be portrayed as really “enjoying” the little things in life so much more, especially in photos. But perhaps that’s the luxury of living life in captivity where you don’t have to worry about food all the time.